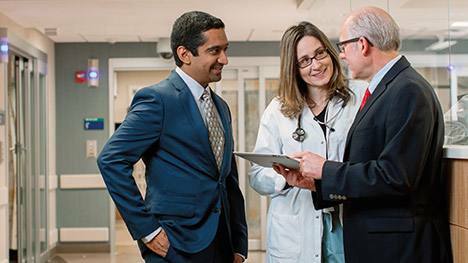 To help patients receive timely care, Kalyan S. Pasupathy, Ph.D., Ronna L. Campbell, M.D., Ph.D., and Thomas R. Hellmich, M.D., are looking at the problem through an engineering lens. An estimated 1 in 5 adults in the U.S. lives with a mental health condition, reports the Substance Abuse and Mental Health Services Administration. Over 24 million of them failed to receive treatment in 2013, and of those who sought treatment, they found a health care system unwieldy and complex. Researchers in the Mayo Clinic Robert D. and Patricia E. Kern Center for the Science of Health Care Delivery and the Division of Integrated Behavioral Health are looking at the system holistically. They apply systems science, operations research, engineering principles and computer modeling to fix some of the most pressing issues in health care, including how the nation cares, or doesn't care, for its mentally ill.